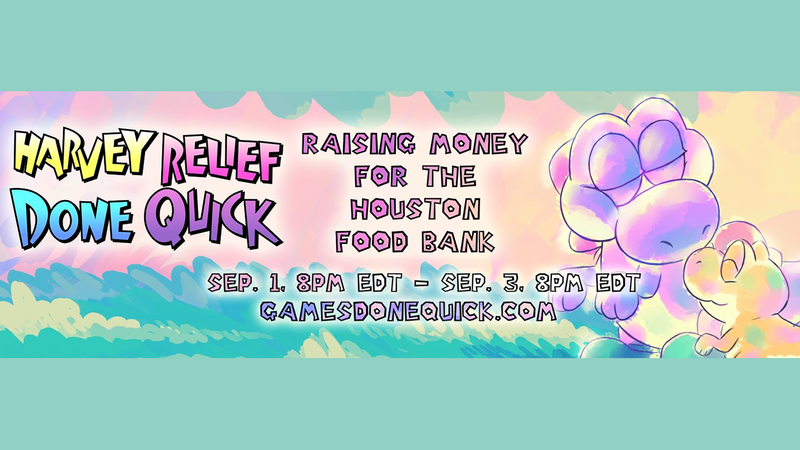 Running from from 10AM AEST today through 10AM Monday, Harvey Relief Done Quick is a speedrunning marathon raising money for the Houston Food Bank, an organisation that's using its resources to feed people displaced by the disaster. Speedrunners will tackle 45 games during the event, from Bastion to Wario Land 4. The event is being broadcast on Twitch, with 100 per cent of viewer donations going towards the relief effort. What's amazing is how fast this event came together. Games Done Quick tweeted a poll on Wednesday, August 30, gauging interest in a Harvey charity stream. At 5AM the next day they posted a form for speedrunners to submit their runs to be considered for inclusion in the event. By 12PM they had over 350 submissions. Less than a day later, Harvey Relief Done Quick was made official. Games Done Quick just speedrun setting up a charity speedrun marathon. Tune into their Twitch channel starting at 10AM AEST today if you want to help incredibly talented gamers do a lot of good. Currently at least 1200 dead in Bangladesh and 1/3 of the country under water... but hell, one of the richest countries in the world can always do with more charity, and the pictures are better.